A large number of residents attended the public session of Lydiate Parish Council’s meeting last night in Lydiate Village Centre. 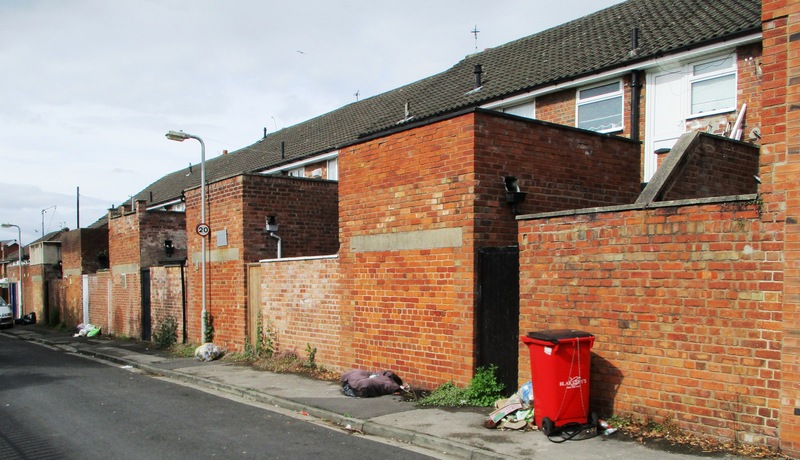 They were there to raise concerns and objections to a recent planning application to build a 3 storey block of flats on the site of derelict garages off Saville Road to the rear of the row of shops on Liverpool Road. Rear of the Liverpool Road shops on Saville Road. The proposed flats would be adjacent to them if Sefton gives planning permission. The site is surrounded on 3 sides by bungalows and 2 storey houses so the fact that the application is for a 3 storey building means that overlooking of the neighbouring properties is a big concern. Another concern is lack of adequate car parking facilities for the development in an area where on-road parking is hard to find at times due to the shops and commercial premises on Liverpool Road. I must admit when I first became aware of the plan a few days ago my first thought was along the lines of you surely can’t shoehorn that many flats into that small space and anyway a 3 storey building is inappropriate for the site. My 2nd thought was I wonder if the applicant is applying for a 3 storey block thinking they are likely to be knocked back to 2 storeys via the planning process by Sefton Council Planners? The Parish Council decided to recommend refusal of the application to Sefton Council’s Planning Committee. However, the Parish Council does NOT have the final say; that is in the hands of Sefton’s Planning Committee, so anyone wanting to raise concerns about the application needs to write into Sefton Council ASAP.